Appearance (0-20): Another beautiful looking stick from AJ Fernandez. He uses an extraordinary maduro wrapper, the PA Broadleaf. 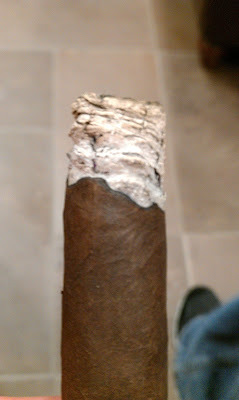 The wrapper is very toothy from aging, which you will see on the ash as well. There are some small veins and seams on the wrapper, but nothing to be wary about. There is a small foot band at the bottom of the cigar that signifies its brand. There is nothing overly flashy about the cigar if you have never smoked it before, but all seems good. Construction (0-20): When you pick up the cigar, you can tell how tightly packed it is. While it may be a small cigar in length, it makes up for in filler. A nice clip of the cap yields very thick white smoke on every draw. The ash on this stick is superb! It is pure white, and created a beautiful contrast on the dark maduro wrapper. The ash is smooth, holds on for about 1.5 inches, and doesn’t flake at all. The burn was very even on the many that I have smoked. Strength (0-20): This sits in the realm of medium to full, depending on your tolerance. While this doesn’t have a ton of heft, it has a very good balance of strength and flavor. Flavor (0-20): The Diesel is a flavor bomb for the value. You will find premium, well aged tobaccos that start off with quite a bit of spice. You’ll find this spice throughout the smoke, yet it dulls down the farther you smoke. Leather notes, along with strong flavors of oak are present. All of these flavors, coupled with sweetness of the maduro wrapper, really give you a complete cigar in terms of flavor. Value (0-20): $4.50……that must have been a misprint when they sent it out, and just kept it at that retail. I have long said, this is probably one of the best all around cigars that you will find under $5.00. Buy a bundle or box. Additional Notes: Smoked at CI paired with water. 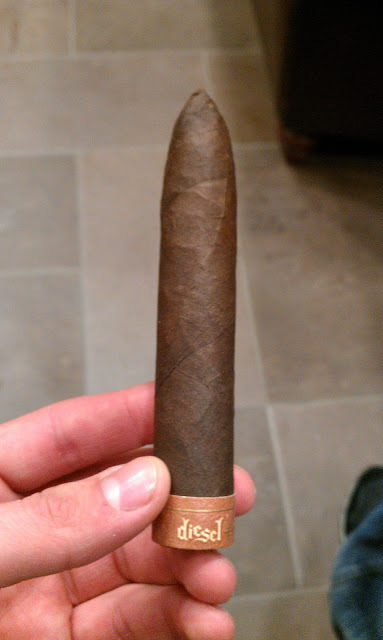 Overall (0-100): I’ve been a long fan of AJ Fernandez, Nicaraguan tobacco, and the PA Broadleaf wrapper in particular. All of these aspects put together give us a very well done cigar, and a home run for its value. Whether you are a new smoker or expert, this is a great smoke to kick back and enjoy.